Samsung Galaxy Nexus is getting ready for its international launch, we’ve yet to learn some solid info about the release of the newest Android version on tablets. 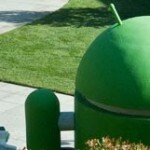 However, we have a tiny hint, thanks to a leaked press image showing Android 4.0 Ice Cream Sandwich in its tablet version. Last I heard among the first slates to receive the update there were the Samsung Galaxy Tabs from 2011 and the Motorola Xoom. We’re also expecting HTC Quattro, a quad core tablet and a Lenovo and Acer slate to debut with four cores of power, too, all of them running Android 4.0. The image above is the one leaked, showing a render made by Google and detailing two devices that look like the Galaxy Nexus and something that resembles the Galaxy Tab. Of course, don’t expect to be blown away by the experience of Android 4.0 on a slate, as this OS has Honeycomb at its core. Other stuff worth mentioning is the set of 3 buttons in the lower left, that have a changed design, plus the cyan-colored accents. New fonts are also used and new symbols for various statuses. Lenovo hasn’t only been messing with the tablet segment, but also with the ultrabooks it seems, since there’s a new model out there, that was just uncovered. This is the ThinkPad X1 Hybrid, a device that adopts the ultraportable X1 slick design and combines it with a touch of Android for extra battery life. There’s an Instant Media Mode here, one related to the Android use, that will give us the flavor of the Google mobile OS that Lenovo has been offering on its tablets till now. The advantage here is that the Hybrid comes with instant boot, double battery life, reaching 10 hours of web browsing and a very user friendly experience and all thanks to the Instant Media Mode. Any developers out there want to tell us how or if they plan on incorporating these new APIs into their apps? Mozilla is working hard on all fronts, so it has both an OS coming next year and new versions of its famous browser. Firefox 8 is already out and considered a pretty complete version of the famous browser, but now we also have Firefox 9 in beta phase, bringing a fresh UI to Android tablets and Lion machines. Tablets are also taken into account by this version, since it gets a new look, optimized for larger screens and places tabs on the side with thumbnails. This reminds me a bit of Honeycomb’s multitasking pane, but there’s still enough room on the right for a full web page, so worry not. An action bar includes all the features you could have ever needed into a more compact space. While I’m not a huge fan of Bing, I felt the need to check it out after Microsoft spent some time highlighting the changes they’ve made to the experience. Their Android and iOS applications have been overhauled to make extensive use of HTML5 for several reasons. 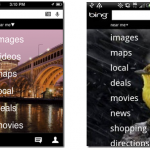 Their aim is to create a unified experience for both platforms (and presumably more in the future, including their own Windows Phone 7) so that no matter which device you happen to be using the “Bing experience” will always remain the same. HTML5 also gives them the ability to update their application and servers without the user needing to head to the Android market. We imagine the only time they’d need to issue an update is for a security patch, a bug fix or a new feature or two that ties into the OS. The technology, HTML5, is great, but in this day and age I still prefer a native application. After using the new version of Bing, I could tell it wasn’t quite as “snappy” or “fluid” as some apps are when their UI elements are not being rendered in webview. 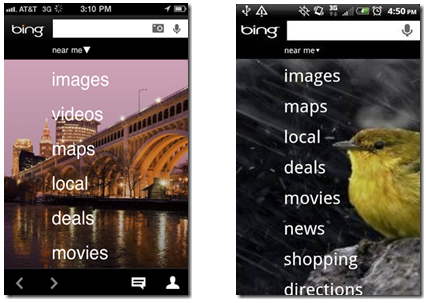 Even then, Bing’s new app was still friendly to touch and it’s exciting to see how HTML5 will help their service evolve in the near future. Find the application in the Android market here and check out the video highlighting all the new changes above or over at Microsoft’s site. Android Central have apparently gotten their hands on materials regarding one old and one new device by Barnes & Noble. 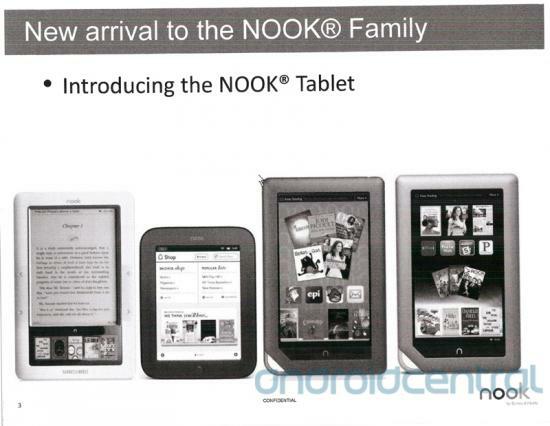 First off, that NOOK Tablet. It’s said to be a bit smaller and thinner than the NOOK Color, though with a nice set of internals to help OS performance. Inside will be a 1.2GHz TI OMAP4 dual core processor, 16GB of RAM and a 32GB microSD card slot for expansion. Its display comes in at 7 inches and has 1024×600 resolution. We’re also getting WiFi n. So it’ll be faster, that’s for sure, but that’s about all we know for now. It’ll cost $250 and should be available beginning November 16th, according to the slides. This puts it right behind Amazon in terms of launch, though the price tag could be a major difference in consumers’ purchase decision. I should note that the NOOK Color will get a price drop to $200 – more on that below. If true, both tablets will be in time for Black Friday, one of the biggest shopping days of the season. It’ll be interesting to see who comes out ahead in this race. We have a slight idea, but we won’t entertain the thoughts at this time. While OS details weren’t mentioned, we’d imagine some form of Android 2.x sits beneath Barnes & Noble’s customization. Android 4.0? Well, this tablet just wasn’t meant for it officially, but there could be some very good stuff headed our way unofficially once it does launch. 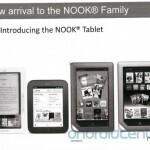 With that comes a supposed imminent price drop for the NOOK Color. It will go down to $200 from $250 and we’re also supposed to be seeing a software update to version 1.4 soon. It brings with it Hulu support, Rhapsody, MOG, Grooveshark, more digital magazines to choose from and a lot more apps. Doesn’t sound like a bad deal at all. Motorola XOOM 2 has been a lot in the press lately, including in a bunch of images and with presumed specs available. Now we also get a pamphlet showing the device, that Engadget dug up from its sources. It appears the product will be sold for 399.99 euro by Carphone Warehouse in Ireland. Taking note of the presents pictured here and the Christmas mention, we’re talking about an Xmas offer, so we might see the product launched around the winter holiday time. Xoom 2 is supposed to come with a 10.1 inch display, a dual core 1.2GHz processor, a camera with 1080p recording ability and 1GB of RAM. The device is 9mm thick, just a bit beefier than the Samsung Galaxy Tab 10.1, at 8.6mm. Motorola hasn’t yet announced the Xoom 2 and in case you’re wondering about the OS, I wouldn’t be surprised if this were Android 4.0 Ice Cream Sandwich material. Considering Motorola Mobility was purchased by Google this is one of the perks of the acquisition: getting Android 4.0 on new products first. Prime has just been confirmed for launch this month and it’s coming on November 9th, it seems. The confirmation came through a couple of leaked slides from an investor’s conference on Monday. The slate will come with the quad core Tegra 3 processor on board and strangely enough Android 4.0 is also mentioned in the mix, so we could actually see this ASUS device as the first Ice Cream Sandwich tablet. Last I heard, the Motorola Xoom was supposed to be the first tablet with this OS, through an upgrade. The slides from ASUS also mentioned two Android products coming in early 2012, focused on “innovation and product perfection). Windows 8 tablets are also there, scheduled for Q3 2012 and it looks like a busy year ahead of ASUS. Since the Eee Pad Transformer managed to sell 400k units a month at some point, the expectations from its follow-up are great. Will they be met?